Chuck’s was founded by Chuck Lesher and his son Jack. When Chuck retired in 1989, Jack continued to raise the quality of the shop, expanding it to include vintage decoys, sporting advertising art, an excellent selection of books and custom knives. In recent years, vintage military arms of the highest quality and condition have been added and our inventory is ever-changing. We attend major shows throughout the year, always searching for interesting items, with an emphasis on top quality and condition. We appreciate Jack’s expertise as he has literally spent his entire life in the firearms business, both as an avid collector and retailer. His knowledge is well known, and he is widely respected among his peers in the industry. 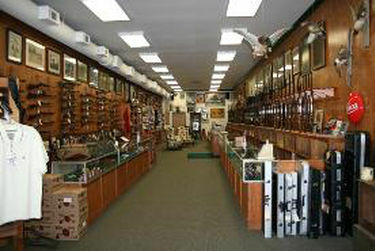 We are located at 761 A Miami Circle, Atlanta, GA 30324. We are open Monday through Friday from 9:30 a.m. – 6:00 p.m. and on Saturday from 9:30 a.m. – 5:00 p.m.
We are closed Sunday. Stop by or give us a call at 404-266-1250.